Whilst it is not the most exciting part of jewellery design, fastenings are really important! They need to be secure, easy to navigate and blend in with the rest of the design. There are many things that depend on the way you fasten your necklace or bracelet design such as the size of cord, thread, wire or chain that you are using as well as the look and style of the design itself. In this blog post we've put together 8 different ways you can fasten both bracelets and necklaces so that next time it comes to choosing which method will work best for your design, you will have plenty of options. Crimps are an easy and sleek way to secure a design using thread, flex-rite or cords (depending on your crimp size). Simply thread the material through the crimp, loop it back around on itself and squeeze the crimp together. This will create a secure loop for you to attach a clasp or other finding. 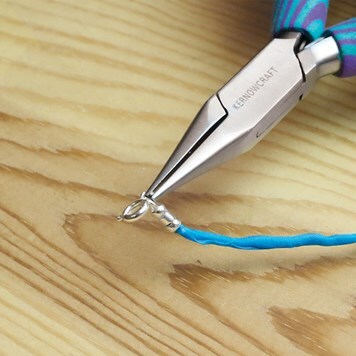 Crimps are not ideal for very fine thread or silk as it is possible that it could slip out - however you could try creating a knot within the thread to give the crimp more to hold onto. You can close crimps with snipe nose pliers, or for small, neat crimps try our magical crimping pliers or for mini crimps our micro crimping pliers. These findings are ideal for thicker cords and thonging. There are the traditional box style cord ends which work well with cotton cord and leather thonging, as do our sterling silver end caps or silver plated cord ends which give a really nice professional finish. Alternatively, there are pinch style cord ends which are perfect for a more flat material such as our microfibre flat suede or leather thonging. All come with a loop ready to add your jump ring and clasp. Use Devcon 5 minute E-poxy glue to help ensure cords are well and truly secure. These type of findings are perfect for beaded bracelets and necklets that need to be finished with a knot. A knot cover has clam-like cup that holds and hides the knot in your thread, simply use a pair of pliers to close the cover over the knot. A necklet end works the same way however it is a little more sturdy for heavier necklace designs. Bead tips also give a neat, professional finish by providing a loop for attaching to clasps or jump rings at the same time as concealing the knot. With some designs a certain type of knot will work perfectly and this option makes jewellery making accessible to everyone. For example, sliding knots work well with cotton, silk and leather cords and allows you to create a fastening that you can adjust accordingly. Toggle clasps are a really easy and secure way to fasten both necklets and bracelets as well as adding an extra feature to your design. All of our toggle clasps have closed loops attached to them ensuring they are secure when knotted onto threads. Ensure your design has enough weight to it to create resistance on the toggle clasp, otherwise, you risk it coming undone. Many of the chains we supply come already finished with a clasp so you can simply add a pendant setting, charm etc. You can also cut open the chain and add features into it. Use side cutters to cut your chain. Magnetic clasps are a really good option for those who struggle with fastening and unfastening clasps. We have magnetic clasps that come with loops ready to attach your design on to. Another neat and secure way to fasten both necklaces and bracelets. Their simple and un-intrusive design will compliment any piece of jewellery. Simply knot your thread onto the loops provided.